« The History Dish: Lebkuchen with How-to Video! As a teenager, I was obsessed with Marshmallow Peeps. I would wait until after Easter and then descend upon Target to buy box after box of marked-down peeps, just pennies apiece. As an adult, I can no longer devour peeps with quite the same enthusiasm, but they still fascinate me. They represent some aspect of my personal history: a yearly spring awakening, marked by yellow and pink confections appearing faithfully on the store shelves. The peeps eagerly peeked out from cellophane wrapped boxes, promising to be lovable and delicious. 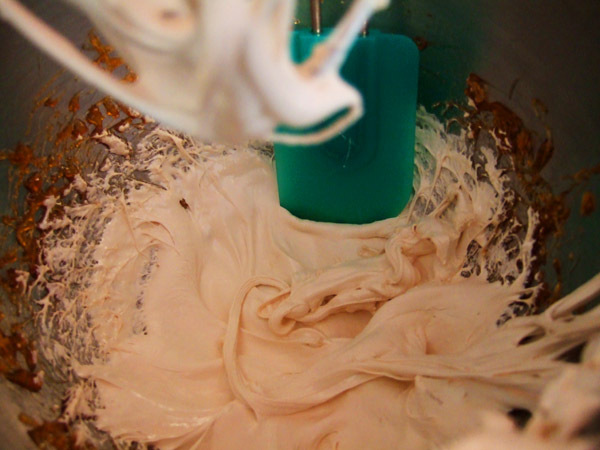 Marshmallows were originally made from “Marsh Mallow,” a plant whose roots produce a sticky, white, mucilaginous substance that can be whipped with egg whites and sweetened. This treat was popular in France in the early 18th century. By the end of the 19th century, the marsh mallow had been replace with gelatin. I have never been able to find fresh marsh mallow, but if I ever do, I’m going to make “original” marshmallows. Sam Born, the founder of “Just Born,” the company that makes marshmallow peeps, arrived in New York via Russia in 1910. Like many other Jewish immigrants, Born went in to the candy business. Candy was cheap to make and easy to sell, the perfect start-up for a new immigrant looking for work. In fact, many American candy companies were founded by Eastern European Jewish immigrants, in including Tootsie Roll and Double Bubble. Born opened his first retail location in Brooklyn in 1932, and in the 1950s, acquired a candy company called Rodda that produced a line of marshmallow Easter peeps. Despite the fact that the company’s owners are still observant Jews, they are copacetic with the decidedly non-Kosher peeps. “We see no conflict in offering a non-kosher brand or one that is so associated with Easter. We are a candy company for everyone,” said Ross Born, Bob Born’s son (source). When marshmallow peeps were first produced, they were entirely handmade. Each peep was squeezed out of a pastry bag one at a time; they were sugared and the eyes were hand-painted, and then the marshmallow chicks were left to dry. Each peep took 27 hours to produce from start to finish. Now, automated peep-making machines churn out several thousand peeps a day–each one takes about six minutes to make. Watch this video–it’s awesome when the shoot the eyes on. After I read about the original, labor-intensive Peeps, I wanted to try making a Peep on my own. I just took a marshmallow making class at the Brooklyn Brainery, so I was inspired to creatively flavor my Peeps. But what flavor should a chicken shaped marshmallow be?? I used Alton Brown’s marshmallow recipe, and replaced the water with–you guessed it–chicken bouillon! I wanted a delicious, sweet and savoury, chicken-flavored Peep! 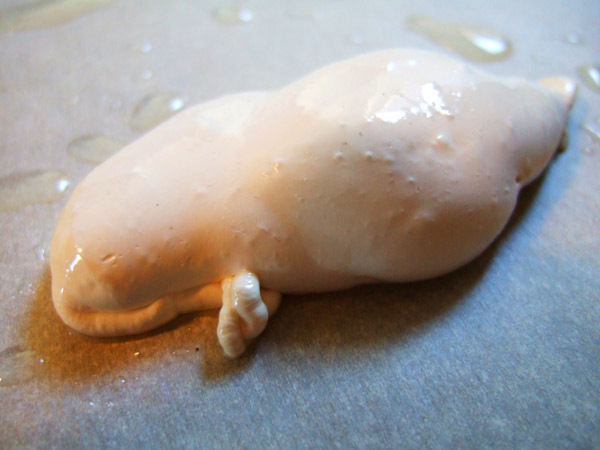 I followed Brown’s recipe, but something went wrong: I don’t know whether I cooked the sugar too long, or it’s because I used chicken bouillon instead of water, but my end result was less like marshmallow fluff and more like taffy. My second try was slightly better, and I formed it into one misshapen Peep. I sprinkled him with yellow sugar and dotted his eyes on with a toothpick covered in vanilla extract. He tasted just like ramen noodles. Kudos to you for giving it a try! You’ve inspired me to give this a go myself. Thanks for sharing…love the history!!! Marshmallow, as with most candy, is very water dependent. The high salt in the Bullion probably threw off the balance, as well as any protein in there. Mark S. made some turkey mallows with some turkey stock he had during the last self sufficiency challenge. They were dense, but I suspect the low salt in the stock probably helped. Also remember the stock or bullion has gelatin in it so you may have over gelatined. Perhaps try again with low sodium chicken STOCK like Kitchen Basics, and only use part stock for the liquid. I think you’re right. I went with powdered bullion because I thought it would have an intense chicken flavor (which it did) and left out the salt in the recipe. But I think the excess sodium may have deflated them. 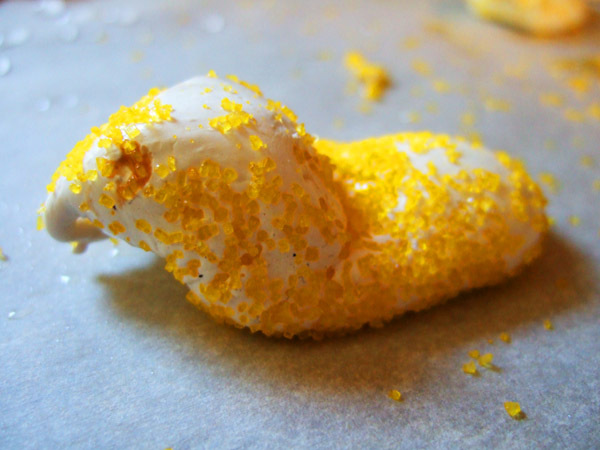 Who would have thought of actually making chicken flavored peeps? Love the history of peeps, too, that I’d love to include in my updated chocolate peeps post this week. Hilarious! Pursuits like this are the stuff of life. Oh Sarah, only you are this wonderful!! Happy, happy Easter.